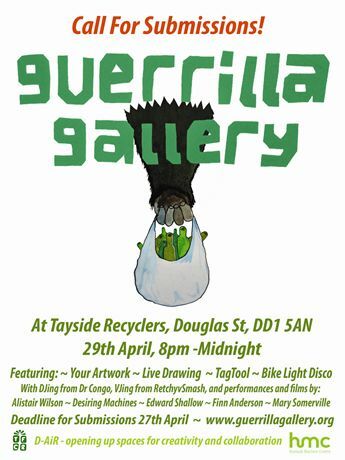 I will have some artwork at the Guerrilla Gallery event in Dundee on Friday the 29th April. I am exhibiting the photos I took on my ‘More than a Snapshot’ photography class. Read about this here. The work will be protected on a wall in the Tayside Recyclers building. I have had photos, illustrations and 3D artwork exhibited at the previous two Guerrilla Gallery events. One in the Hannah Maclure Centre Café at Abertay University and also a bigger event at a multi-storey car park in Dundee. The events always have lots on with music, dance and performances. Should be fun.